Hugh Glass (c. 1783 – 1833) is a famous American explorer of upper Missouri River. He is best known for his survival story after he was brutally attacked by a grizzly bear. While looking for food near the Grand River in 1823, Hugh Glass disturbed grizzly bear mother. She attacked him to protect her two cubs. The bear wounded him badly, but Glass managed to kill the terrifying animal with his knife. His wounds were so bad that his fellow hunting partners were convinced the man would not survive. They started digging a grave for him but were interrupted by the attack of Native Americans. Glass’s partner covered him with the bear shroud and run away. Hugh Glass was left without any weapons or equipment for death. When Hugh Glass eventually regained consciousness, he found himself with a broken leg and deep cuts on his back and chest. He set the bone of his own leg, covered himself with the bear shroud and began his 200 miles (320 km) insane track to the nearest American settlement. He prevented gangrene from infecting his wounded back by allowing maggots to eat his dead flash. He sustained himself mostly by eating wild berries and roots. He also managed to steal dead bison calf from two wolves. It took Glass six weeks to reach civilization. The life of Glass was featured in two movies: Man in the Wilderness (1971) and The Revenant (2015). Juliane Koepcke (born 1954) is a German biologist. Even she is known in her field, but she is more famous as a survivor of a plane crash. In the early 70s at the age of 17 Juliane was on a flight with her mother in Peru. Their plane was struck by lighting during strong thunderstorm. The airliner disintegrated in mid-air and Juliane fell from about 3km (10,000 ft). She was strapped in her seat while crashing through the rain forest. Juliane was the only survivor out of 92 passengers and crew. She found herself in a rainforest with injuries of a concussion, broken collarbone, a wound on her arm and a swollen shut eye. The sweets Juliane found while looking for survivors was her only food. She followed a small stream expecting it to lead her to civilization. After nine tough days in the rainforest, Juliane finally bumped into a boat belonging to lumbermen. They helped her to get to the safety. Simo Hayha (1905 – 2002), known as “White Death”, was a Finish marksman. He lived on a present day border between Russia and Finland. Simo started military service at the age of 20. This young man turned into a legendary sniper. Hayha broke all records for the number of confirmed kills in any major war. During Winter War (1939-1940) between Soviet Union and Finland, within less than 100 day period he managed to kill 500 soldiers of the Red Army. Hayha operated in temperatures between -40 and -20 ℃ (-40 and -4 °F) and was dressed in completely white camouflage. While Soviet troops were not supplied with white camouflage suits, what made them easy targets. The Soviets put Hayha’s murder as a priority. They tried to kill him with counter snipers and artillery strikes. After multiple failures in March 1940 Hayha was finally hit. An explosive bullet hit him in a lower left jaw and took off half of his face. However, he didn’t die and managed to make a full recovery. Shavarsh Karapetyan was born 1953 in Armenia, Soviet Union. He is a 17-times World Champion in finswimming. Although his name is well known in the water sport, Karapetyan is best known for an incident that made him retire. In 1976 while jogging with his brother alongside the Yerevan Lake, Karapetyan witnessed a trolleybus crash from a dam wall. The trolleybus carrying 92 passengers splashed into the water 25 meters (80 ft) offshore. Karapetyan swam to the sinking bus and managed to get inside by breaking the back window with his legs. With barely any visibility and very little time he rescued 20 passengers. Unfortunately, the combined effect of multiple wounds he received and cold water put him into a 45 day coma. He recovered but lung complication pushed him out of his sport career. Karapetyan’s heroic achievement was not recognized immediately. All related photos were only revealed two years after the incident. 6 years after the incident an article published in a popular newspaper made him a true hero. He received about 60,000 letters. Karapetyan repeated his heroism 10 years later when he rescued people trapped in a burning building. He was rewarded multiple awards including a UNESCO “Fair Play” award for heroism. Roy Benavidez (1935 – 1998) was a member of the United States Army Special Forces. He is best known for surviving the impossible in Vietnam. In 1968 a 12-man Special Forces team was surrounded by an enemy battalion of 1000 people. Benavidez went to save his trapped comrades. The helicopter could not land because of the intense small arms fire. Benavidez jumped from the hovering helicopter and ran 75 meters to his comrades. Under intense fire he was shot in the leg, face and head. Despite injuries, he took charge and directed the team members fire to allow the helicopter to land. While helping his team members he’s got shot in the abdomen and took a grenade fragments in his back. After all of this he was still mobile and still going. Suddenly the helicopter Benavidez jumped from had crashed. The man went and rescued the wounded pilot. Although in extremely critical condition, Benavidez began calling for air strikes and call for another rescue attempt. He was shot in the thigh a couple more times. 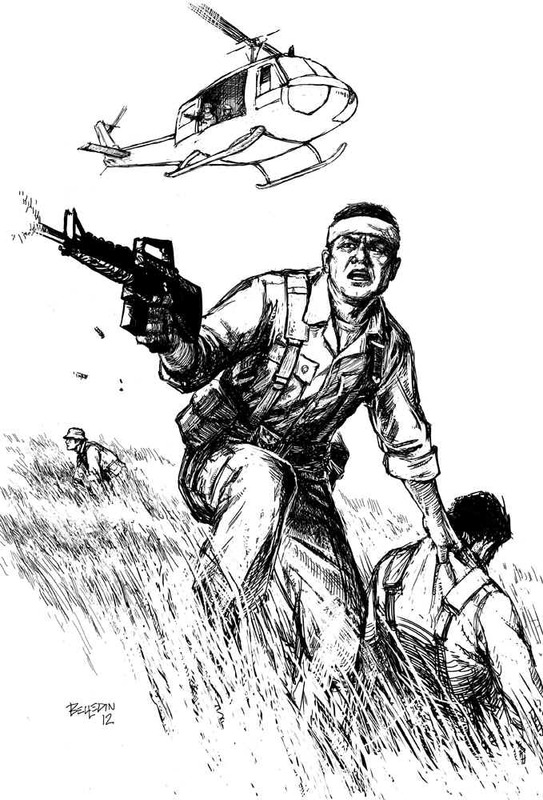 On his trip to the second rescue helicopter Benavidez was beaten and stubbed by an enemy. He managed to kill the enemy in hand-to-hand combat. Once Benavidez finally made it to the helicopter he then allowed his comrades to pull him in. The hero had a total of 37 separate wounds from six hour fight. He saved lives of at least eight soldiers. When the helicopter arrived back to the base Benavidez was pronounced dead and was put into a body bag. As they were zipping the bag he had only the strength to spit on his face to let them know he is still alive. He survived these wounds and received a Medal of Honor. These five people are very different, they lived on different continent and even in different times. But there is one thing they have in common – “Never Give Up” attitude. Let your friends know about these fascinating people – SHARE the article .